As we cruise into the final days of our Pit Crew Picks with Smithfield, we're nearing the main event: the Daytona 500! We plan to cheer on the Smithfield Racing/Stewart-Haas #10 car with a mouth full of this ridiculously delicious sandwich. 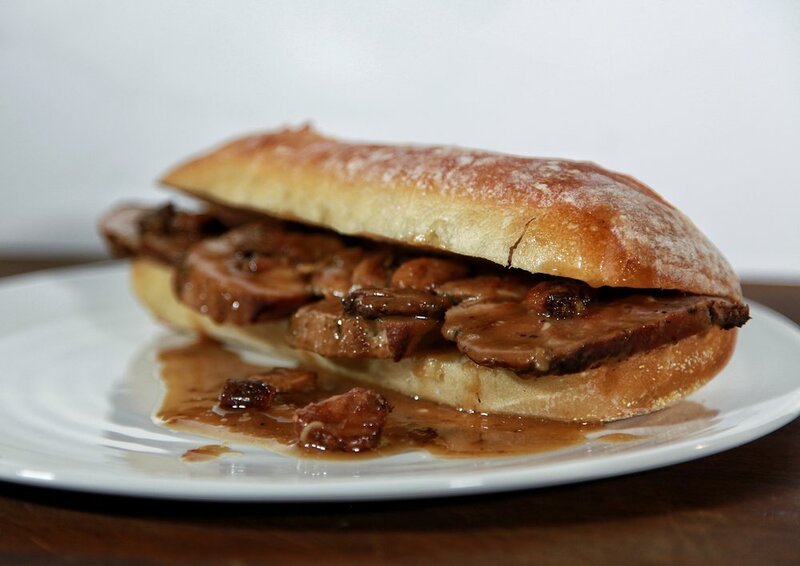 It's like a French dip meets a Cheesesteak but with delicious, thinly-sliced pork sirloin. (And the roasted garlic and bacon gravy makes it that much more delicious)! NOTES: Conveniently pre-seasoned, Smithfield Marinated Fresh Pork is the perfect base for any style of dish – whether you’re entertaining or looking for a quick and easy weeknight dinner. Simply grill, roast, sauté, or slow-cook and you’ve got a delicious meal ready in minutes. If you're looking for a slightly different spin on this recipe, the sirloin comes marinated in an assortment of other flavors including Applewood Smoked Bacon, Roasted Garlic & Herb, Sweet Teriyaki and Slow Smoked Mesquite. You can also find these flavors in other cuts, such as the tenderloin (see our Bacon Cubano Sandwich). Before searing the pork, use a paper towel to pat it dry first, This helps give it a crispier sear. Wrap the head of garlic in foil. Before sealing entirely, pour canola oil all over the garlic so there's ample oil inside the foil ball. Move the sirloin to the oven and cook uncovered for 40 minutes on a baking sheet with a rack, flipping it halfway through. Once cooked, let sit for 10 minutes before cutting it into thin slices. In the skillet you used to cook the pork, add in water over medium heat and use a wooden spoon or spatula to scrape up all the bits on the bottom. Let water reduce in the skillet for 2 minutes, lower the heat to medium-low and then slowly whisk in the flour and bacon fat (or if you prefer, butter) to make a brown gravy. Squeeze the roasted garlic into the gravy and stir. Begin to build your sandwich by placing several slices of sirloin on a hero roll. Immediately pour the hot gravy over the pork slices. Optional: add horseradish spread to the inside of the top hero half and caramelized onions atop your pork and garlic pieces. Serve with extra gravy for dipping.